I suppose I was a "do-it-yourselfer" and a "maker" in some ways long before those terms took on new meanings. But the Maker Movement is a subculture that is a lot less "sub-" than it was a few years ago. Back in the 1970s, when the big computers became available as personal computers (PC), it started a subculture of DIY types who were building their own computers and writing their own software. The maker movement definitely has roots in that and the hacker (in the good guy, white hat, sense of the word) movement. In 2005, Dale Dougherty launched Make magazine to serve a community that was growing and the following year they launched Maker Faire. Though makerspaces have varying names attached to them, they attract those DIYers who want to build something rather than just buy it. While hacker culture which is focused on software rather than the physical objects,both groups share an interest in building new creations as well as hacking at existing ones and making them something new. A makerspace in a school setting may have a more obvious educational purposes and intentions, but all of these spaces foster an informal way of using and learning practical skills and applying them to design. Two events that I am involved in this month use the maker approach to informal learning. New Jersey Makers Day runs two days this year - March 18 and 19 - so that it can be marked both in schools (on Friday) and have a school audience in community spaces such as libraries on Saturday. There are many activities planned across that state in schools, libraries and other makerspaces. Last year, there were over 15,000 individual attendees at 150 participating sites, including libraries, museums, schools, commercial makerspaces, and AC Moore stores that were spread across all 21 counties of New Jersey. There is probably something similar going on where you live. As this movement grows, companies and makers selling their creations has become a commercial segment that is also growing. This includes big companies that sell hardware like 3D printers and supplies to the individual selling custom items on a much smaller scale. Both are "shaping the future of our economy." The NJEDge.Net Faculty Best Practices Showcase on March 23, 2016 at Stevens Institute of Technology, Hoboken, NJ is focusing on STEAM - that's STEM with the needed addition of the Arts, including language arts and the digital humanities. I am doing one of the presentations along with Emily Witkowski (Maplewood Public Library) and Danielle Mirliss (Seton Hall University) titled "The Maker Movement Connects STEAM Across New Jersey." The maker movement really fits well with the STEAM (and STEM) approach to learning. In preparing for my talk this month on "The Disconnected," I came across the organization Encore.org that has a Higher Education Initiative which is looking at the impact of an aging population on higher education. Those that I am calling "The Disconnected" are not disconnected in a detached or disengaged sense, but are instead disconnecting from traditional modes and sources of information and learning. “Quilting in America market is worth $3.76 billion annually” according to a trade survey trying to get at the size of the quilting economy. Sandra is not going to her local college to learn. She is not interested in credits or a degree. Quiltworx is the company from which she is getting her certification. The podcast covered why she decided to get this certification and how her family helped her figure whether the certificate was worth the cost. She has a business plan, and expects her certificate will pay off in 18 months. The "Baby Boomers" are just one age segment of those I am finding to be part of "The Disconnected." The largest age group is much younger and includes the traditional potential students for undergraduate and graduate programs. And even younger people are being born into and growing up in a society where the disconnects will be so common that they will probably not be seen as disconnects. Here is one example of that disconnect. I came of age in the 1960s and viewed television as a wireless (via antenna) service that was free if you owned a set and supported by advertising. If you grew up in the 1980s, you saw television as a service that came to your home via a cable service that you paid for (even paying for the formerly free networks that had advertising support) and could add additional premium services if you wanted them. You learned to supplement and control that content (starting to call it video rather than TV) using a VCR and videotapes and later DVDs and then a DVR. A child of today is likely to be using multiple networks via multiple devices and may be growing up in a household that has already cut the cord to those 1980s services and devices and hard media formats. So, grandparents and their grandchildren may find some connectiveness in being disconnected in their media consumption and even in how they both are learning and preparing for a working life. Here are some resources about how older adults are connecting to learning and unretirement using both traditional schools and alternatives. Improving Education and Training for Older Workers a survey from the AARP Public Policy Institute. Dave Cormier did a nice post about getting his kids (7 & 9) playing and learning with an Arduino starter kit for Christmas. (Kits run about $100-150 but you can buy an Arduino board for about $20 if you're already working with maker electronics and coding.) If you are an adult, kid, parent or teacher, this first (with more to come?) post is a nice intro into this popular maker tool. One very basic thing he discovered is that you do need to understand code. You don't need a lot of experience with it, but if you have never looked at code (even HTML web page code), it will seem a bit confusing at first. Arduino uses a simplified version of C++ and most people will be able to figure out by context clues (Ah, like reading!) some of what the code is doing. He also learned right away that "arduino" is also software that you need to download and put on your computer. As you start to write you "sketch" (code) in order to upload it to your Arduino hardware via a USB cable, you discover that there are lots of sketches available online and with the arduino software itself to get you started. But you will need to learn new stuff. He shows a simple example of some code with notes (shown above). This code tells the Arduino to send power to pin 13 and then to turn pin 13 on and off at 3 second intervals. 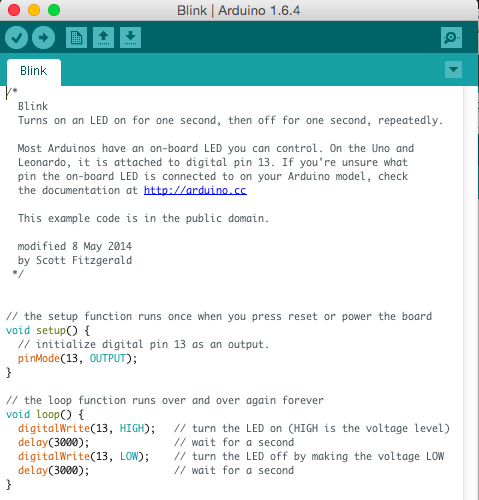 If your Arduino board has an LED bulb in pin 13, it will light up according to those commands. But he also had to learn that the LED needed to plug into the ground that is right next to it and hat the long leg of the LED is the ‘+’ and it goes in pin 13 and the short leg of the LED is the ‘-‘ and goes in the ground. Okay, that's not exactly amazing output, but Dave and his kids are a ways off from building a robotic obstacle-avoiding car (like the one in the video below) which requires more parts, some building and more coding - but it is doable. You can read Dave's first post on his blog and follow his learning. Let's see where the Cormiers go with this.